Like the answer to a whodunit, the solution can seem obvious once you read it. Yet it has been interesting to hear how early readers (and followers of my regular @AlmanackTweets twitter handle) do find Georgian riddles a brain-teasing challenge. ​By the 18th century almanacs were evolving to meet a largely middle-class desire for amusement and instruction. 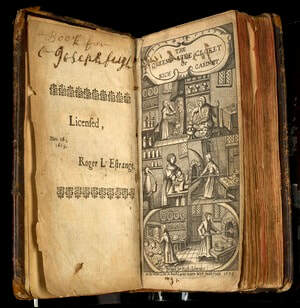 The Ladies’ Diary, founded in 1704, successfully featured essays on famous women, ferociously difficult mathematical problems, and rhyming riddles or ‘enigmas’. Soon ‘riddlemania’ gripped British readers. Unlike cryptic crosswords or sudoku, riddling was often a communal activity, as we see in Jane Austen’s Emma, when the Hartfield party is invited to contribute ‘any really good enigmas, charades or conundrums,’ to form a written collection. Jane Austen herself was a very clever writer of riddles – along with Jonathan Swift, Goethe, Edgar Allan Poe and many other great literary minds. Such puzzles leave me impressed – if not shamed - by the mental dexterity of our ancestors. Needless to say, with solutions to hand, I thoroughly enjoyed setting one of fifty historical riddles to open each chapter in the book - along with fifty solutions, of course. Though blind, I enlighten, though free, I am bound. ​One of my pleasantest research trips was becoming a ‘farmer’s wife’ at Acton Scott Museum, Shropshire, the home of the BBC’s Victorian Farm. The butter churning took as long as the cream needed to turn, and collecting eggs took as long as I needed to find them in the straw. A happy band of history fans washed, cooked, tended to livestock, and when our tasks were done, we chatted and sewed around a parlour table. As the shadows of a winter's afternoon lengthened, time seemed to stretch far longer than usual. This got me thinking that there may be some truth in the notion that time ran slower in the past. While writing from the almanack’s perspective I followed a mass of red-lettered Saints days, the lunar and solar year, the planets, high days and holidays. I began to notice the distinctions between the local hay, barley, and corn harvests, and how the harvest moon swings close to the earth like a gigantic lamp. I searched out All Hallows mummers in Chester’s pubs and tried to commemorate the circling year. I wasn’t very good at telling the time by the Seven Stars (even with a modern app like Star chart), but I can now recognise the phases of the moon and spot the major constellations. My novel became a pleasure to write, as I abandoned social media to spend evenings updating Georgian riddles and charting the night sky circa 1752. And yes, it felt like a slower and more melancholically beautiful year, especially given the recent news that Britain has lost half of its wildlife since the 1960s. Maybe more of us need to connect to the natural time of the past again - for the sake of all our futures.